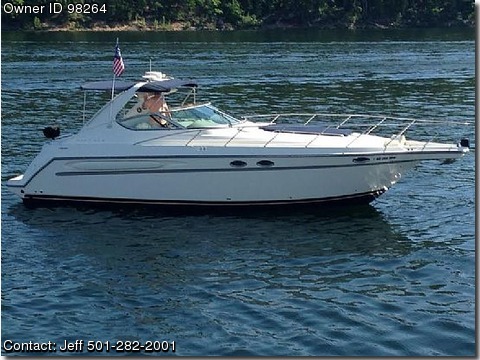 Please contact boat owner Jeff at 501-282-2001. This cruiser has been fully restored throughout. The hull has been completely wet sanded and polished by hand to her original luster and she received new bottom paint in CY13. New carpets, and new Sunbrella helm and sun-lounge covers CY14. Her on deck entertainment system includes 10K sound system that will rock the lake that is accompanied by disco and strobe lights, a fog machine and functional ¡§stripper¡¨ pole for those who dare ƒº She sleeps 6 and has a fully equipped galley and headroom that includes a circular stall shower. For specifics and additional information call Jeff @ 1.501.282.2001.